This photo is probably from the 1880s, perhaps sooner, but no later than 1894, which was the year the brick building now housing the Argus Museum was built. The brick building stands where the frame building in the foreground is located. That's Joe Sochor's electric next to it. Don't know what the big white building is. 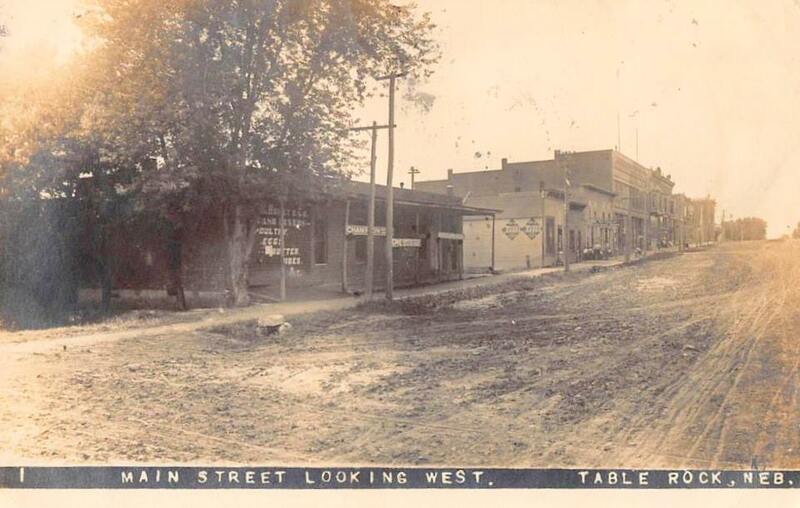 The speculation about this photo being from the 1880s is based on the fact that the building closest in the foreground looks new. It may not have been likely that the present brick building would have replaced it when it was in such splendid shape. the hotel-theater-retail store block probably sits where that building in the foreground stands. If you look closely, you can see at least three frame buildings -- one is the white building with double diamonds, and then there is a dark building beyond it. That third building of about 1-1/2 story may be frame. After that are the emporiums. The first two-story building is probably the Purcell building, and the second part -- which fairly matches it -- is probably W C. Fellers' fabulous store. Photo 259. This appears to be a view taken slightly into the intersection at the south east corner of the square. 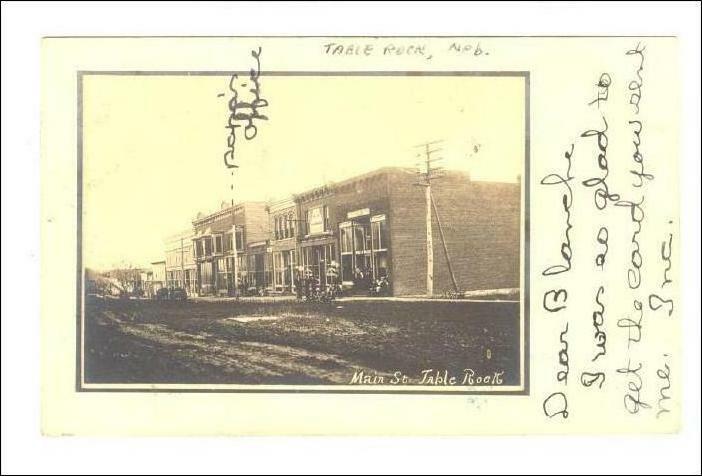 The building in the foreground probably stands where the hotel was built in about 1916. 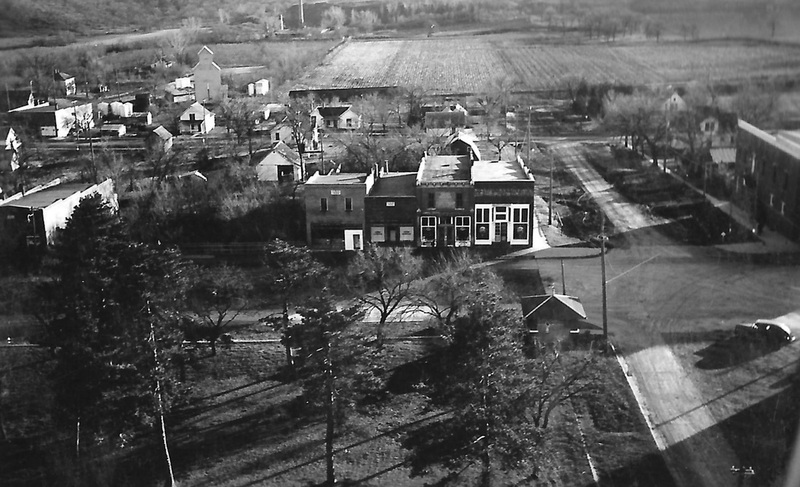 The rest of the buildings in view burned down on February 6, 1920, leaving only the buildings now housing Joe Sochor's electric and the Argus Museum. This photo is likely from between 1898 (when the telephone came) and 1916 (when the hotel block buildings were constructed). The building with double diamonds may be the building occupied at one time by Hanna Brothers Meat Market. This is a photo shared by Fran & Bob Blecha, and is labeled for reference as Photo 1466. Note the dark building to the right of it, and what appears to be the chimney of the south brickyard off in the distance to the left. There is an empty lot to the left, as well. 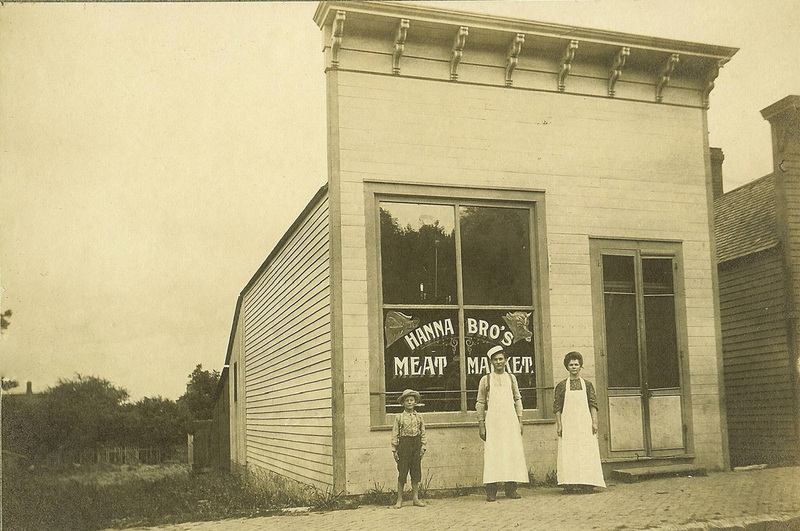 If this is the same building, it appears that the Hanna Brothers is from an earlier time, when the building was new. In this photo, you can see those emporium buildings more clearly. The one with the bay windows is obvious. The building beyond appears to be one store, but it is actually two buildings that were probably built at the same time, perhaps as a "block" of buildings. 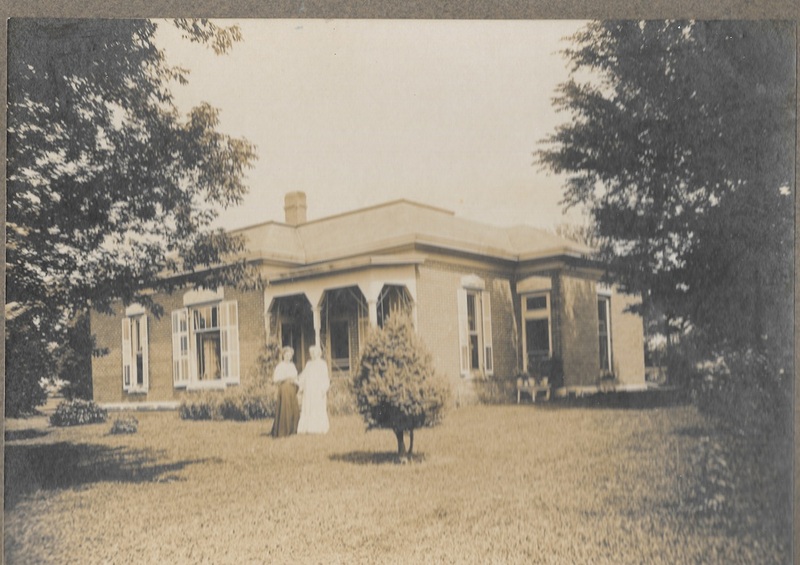 Photo 1905, a postcard on which someone has marked "Pappa's Office," with an arrow to one of those big bay windows on the second floor. We don't know who wrote the postcard or who his/her pappa was. Too bad! An even better copy of the photo in that postcard above. The one with the big hardware sign is now occupied by Sochor Electric, the one to the far right by the Argus Museum. The buildings from Sochor's on down are all gone. Note the fourth building from the right, a short building in comparison to the ones flanking it. That building appears to be the first Fellers Store. At the store is the figure of Anna Fellers, the first wife of W. C. Fellers, who was reportedly a merchant herself before they married. She is quite distinctive looking and is easy to recognize. 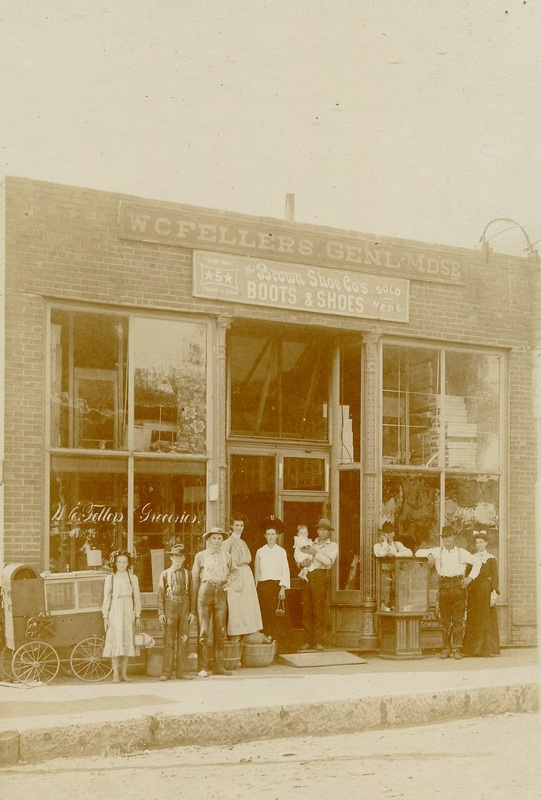 Is W. C. (Willis) Fellers in this picture? This is a neat picture -- note the barefoot girl, the man holding the toddler, merchandise stacked inside of the upper windows, an outside display case, what appears to be a peanut or similar vending machine. Here's a little slide show so you can see the original picture and how it is slightly retouched, and some detail of the people in the picture. The south side of the Square, Photo 215. The man on the far right is Charlie McCourtney, according to his daughter Delores. Note the legs of the water tower on the left. 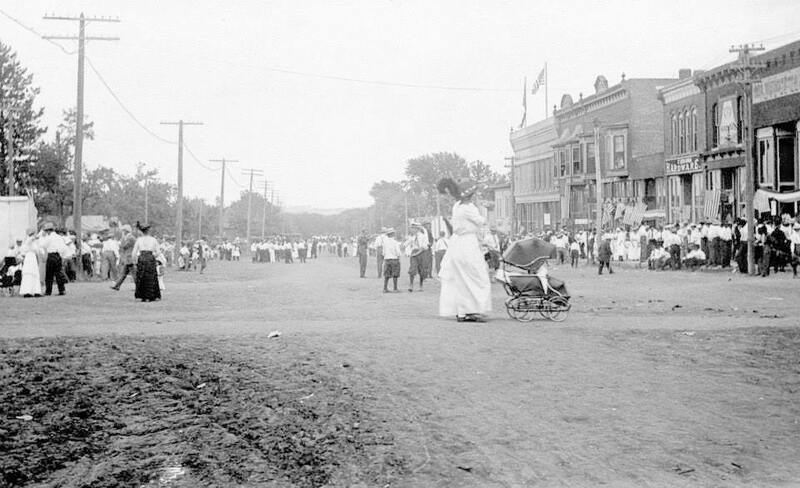 Note the building now occupied by the Argus Museum on the right, built in 1894.
looks like quite a party going on in town! Here are two photos of the same store. You can see this building in the photos above. It is the right part of the two-building block. On the left of this building "block" was Purcell's store, with nearly (but not completely) identical features; you can see it i the far left of this photo. Purcells seems to have always been Purcells; the land never changed hands. The other side of the building appear to have had successive stores. 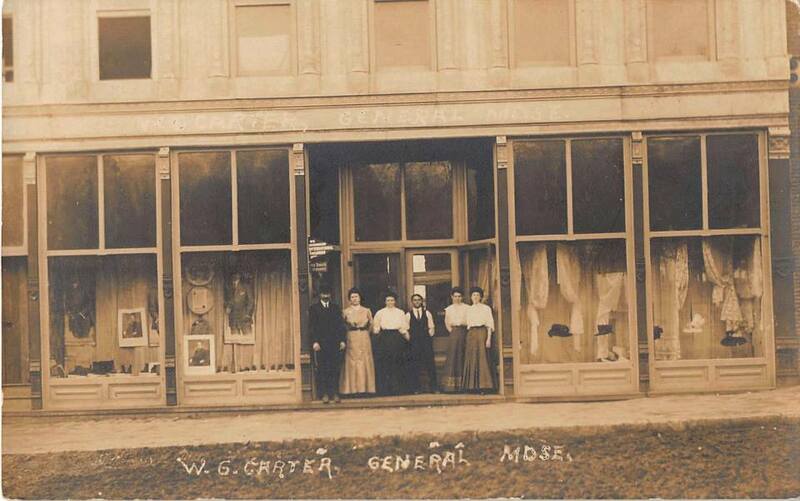 The first of two photos is identified as the W. G. Carter store, the second as the W. C. Fellers store. 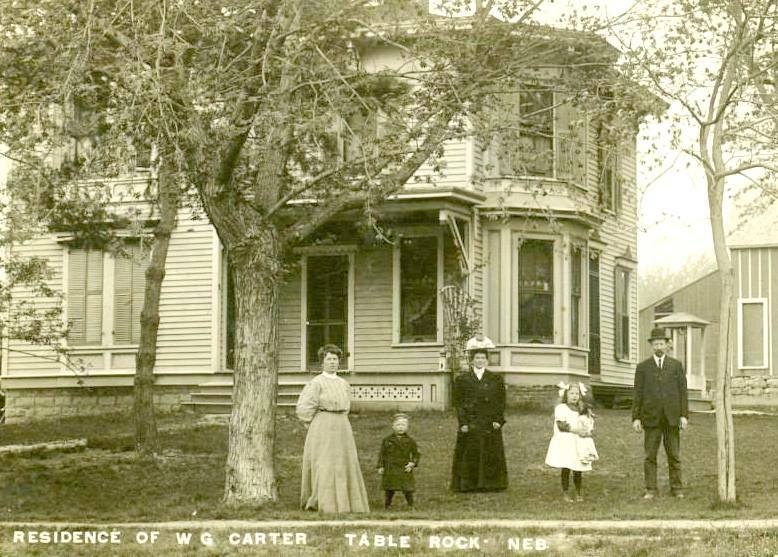 Carter's almost certainly was the first to use the building; it was running ads until at least 1907. 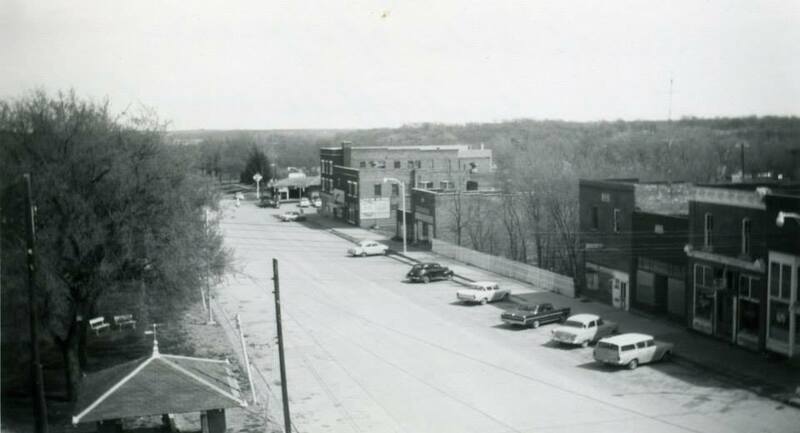 Fellers was the place when the big 1920 fire came. Carters certainly had a larger staff and more elaborate window displays. 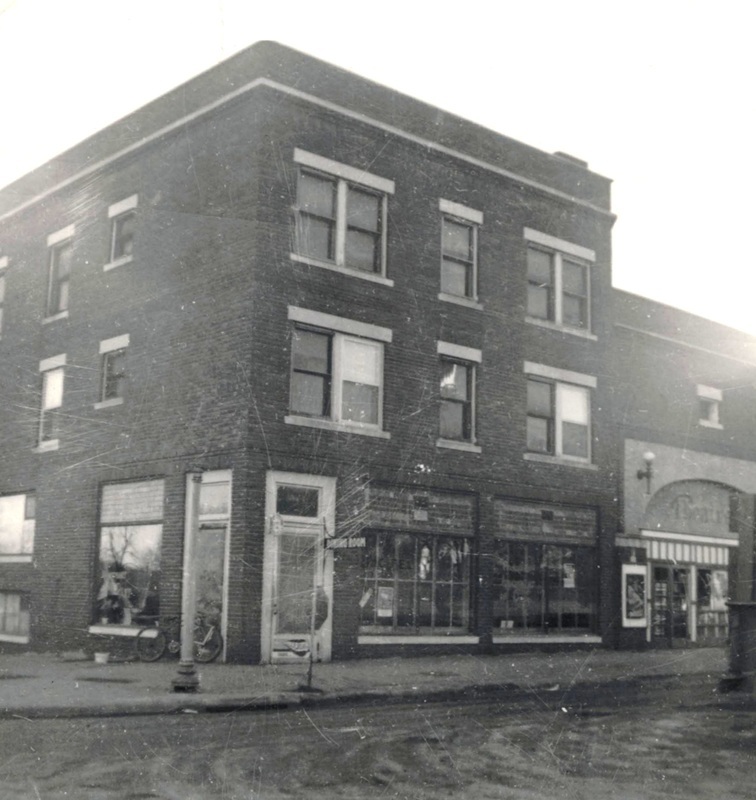 still here all these years later -- the store of william l. taylor, later george buestetta, later the nemechek brothers, then a pool hall, an ice cream parlor, and a cafe, then a newspaper office. then, in 1976, it became a museum and has been every since. 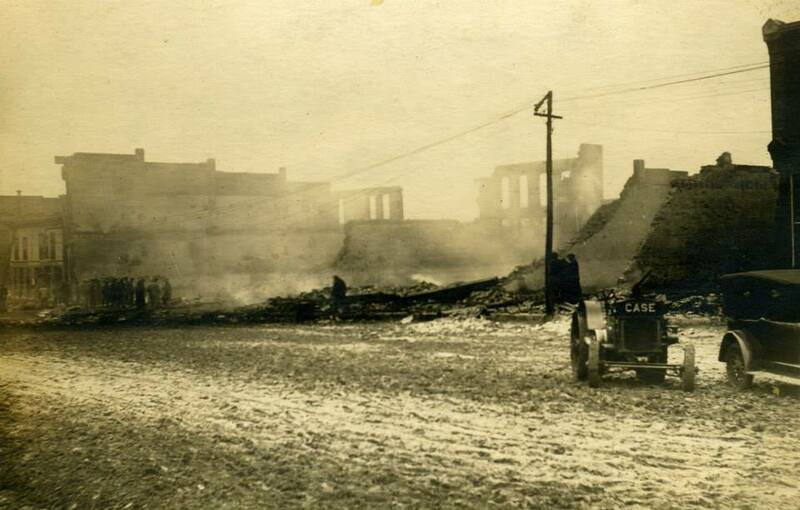 Early in the morning of February 6, 1920, a huge fire destroyed the buildings between the theater and Sochor electric. It appears that this was taken the day of the fire. Smoke is still rising. South walls of some buildings still stand. The east wall of the Purcell building still stands. When an attempt was made to remove it, it fell onto and destroyed the frame building on the other side of it, the only one of three frame buildings that survived. 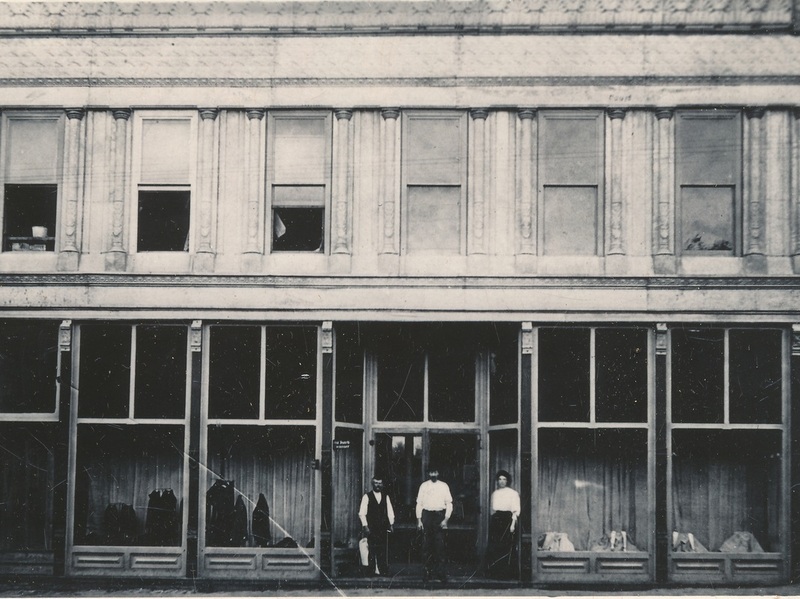 On the very far right, you can see what appears to be the cornice of what is now Joe Sochor's store. In the photo below, it appears that debris has been cleared, so this is not the day of the fire. Note the spiffy theater in the middle of the "Lincoln Hotel Block." The theater opened in October 1916 and the hotel and retail building flanking it followed the next year. Below, Photo 862, the only other known photo of the fire. This appears to show the frame building that was to the east side of the Puircell building. It is difficult to interpret, but that may be the sidewalk running in front, with a stove thrown int he street, and a lot of debris. Or perhaps that divider is between lots and the photographer is standing in the ruins of one building, looking at the side view of the ruins of another. 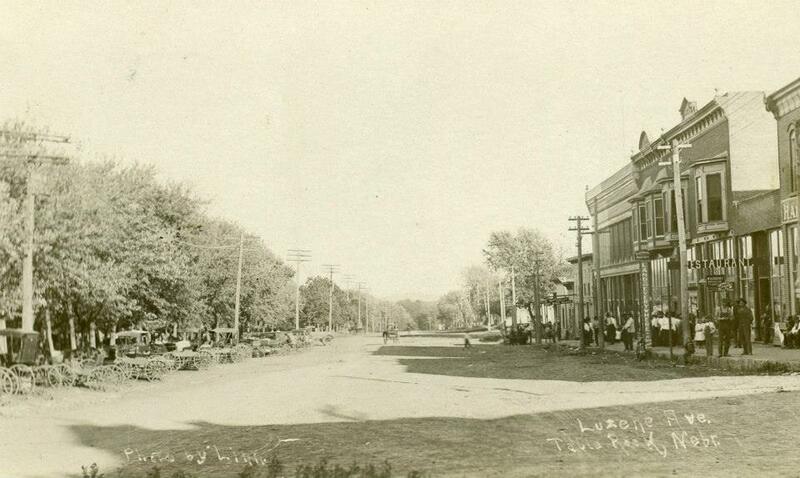 Given that there appear to be tall buildings in the hazy area to the right, it is probably the former, as a side view would show either the residential area behind or the trees in the Square. This is definitely after the 1920 fire. 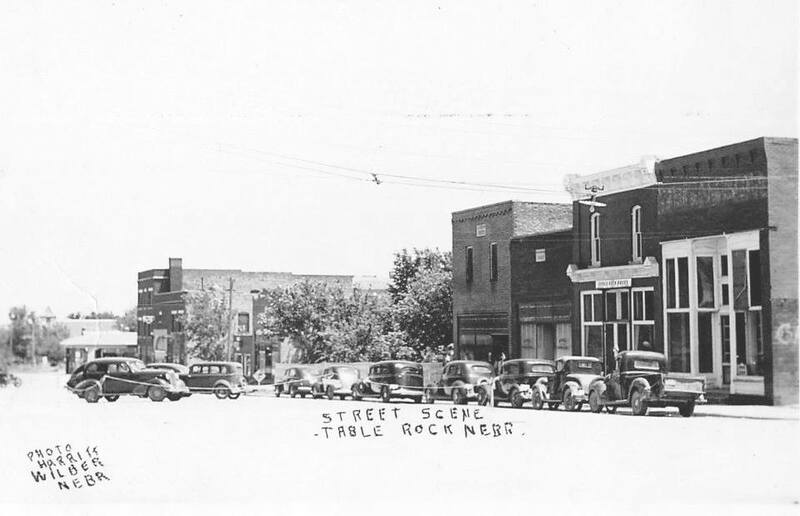 The four buildings in the right foreground would be what are generally today known as Saddle Rock, the mortuary, Joe Sochor's electric, and the Argus Museum. Off to the left is the Purcell building, the only store re-built by its owner after the fire. It was in later years occupied by Knapp's IGA and Vrtiska Electric. 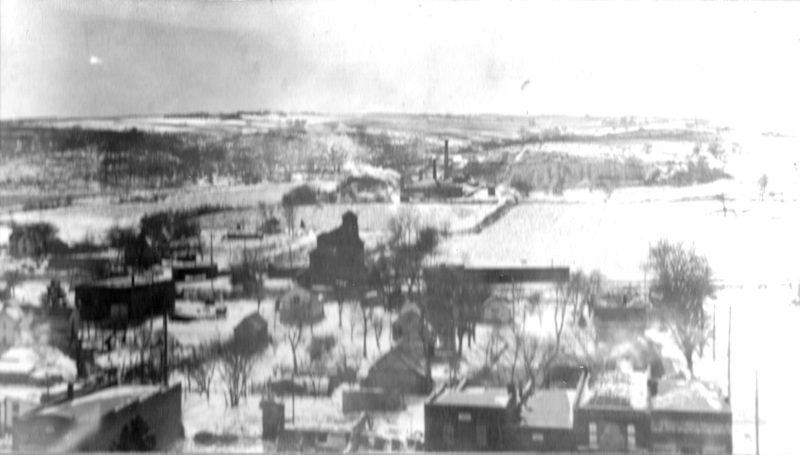 A peek at the south side as seen from the water tower in 1941. Is that the hearse lined up there? the hotel -- in the 1940s? The hotel, circa 1940s. Note the stained glass windows above the plate glass. In the front, it appears that there are shutters behind solid plate glass windows. The southside. Note the trees growing in the "fire hole" bhind the long picket fence, the basements of those long ago mercantile emporiums. 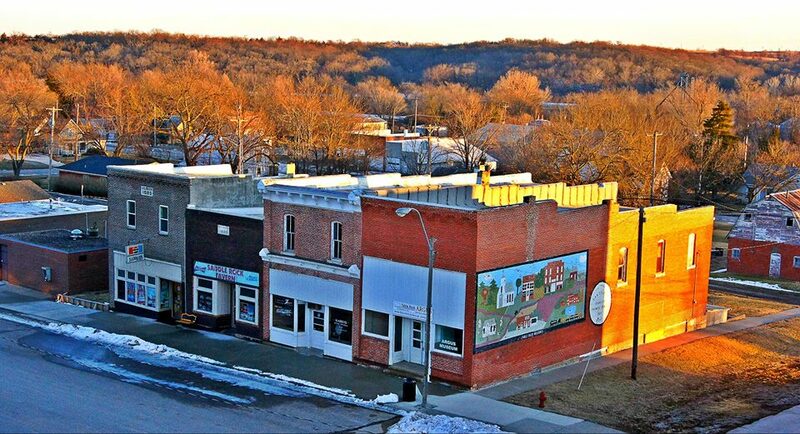 A beautiful photo of the upper part of the south side buildings, taken by Kim Vrtiska in February 2015.